The SPX pile is slowly getting smaller, and I’m starting in on some of the bigger books from the show. 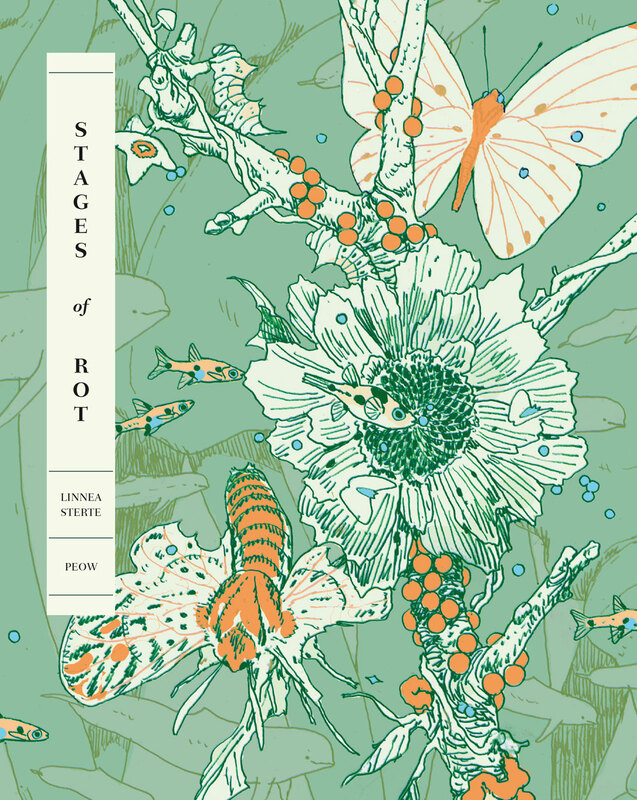 One of those is Linnea Sterte’s Stages of Rot from PEOW Studio. The book is 152 pages in full color, with french flaps and spot gloss. Sterte works mostly in cool pastel colors, and the cover mirrors the book in that way. It’s a lovely looking book, cover to cover. The basis of the narrative of Stages of Rot is the death of a monstrous alien whale, and the effects its death has on the desert it dies above. The story moves over the course of a millennia, and the downstream effect of the death is a blooming of life. It seems obvious that Sterte was inspired by the whale fall phenomenon when writing this book – that’s a natural ecologic event humans nearly hunted to death in the 18th and 19th centuries, but which has recently been observed and documented. The corpse of a large whale is often the source an ecologic boom underwater, and this cycle of life and death is both the nature of life and the nature of this book. Stages of Rot is broken up into five chapters, and each section is loosely based on the stages of decay; fresh → bloat → active decay → advanced decay → dry remains. Each of the chapters is a self-contained short story, although there is a through-line of a mysterious pilot who appears briefly in the first chapter, and then ends the entire book. Throughout Stages of Rot, Sterte is intently focused on the cacophony of the natural world. Insects, fungus, worms, slugs, fish, crustaceans, birds, moths – all of them illustrated in painstaking detail, sometimes to the degree that they overwhelm the page or panel. That’s not a compliment – there are some points of the book that seem over-illustrated. They confuse the eye and draw you as a reader away from the action of the book. 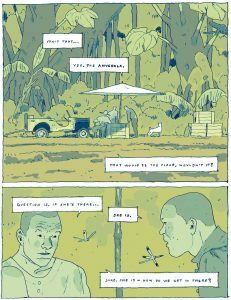 That said, any cloudiness of narrative seems inherent to the project – an effect desired so much that the bustle of these panels seems to amplify the mysticism of the story instead of detract from it. 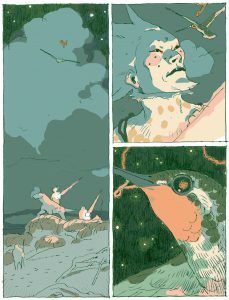 Sterte’s comics seem directly influenced by Miyazaki – it’s hard not to see Nausicaä of the Valley of the Wind’s toxic jungle in this book, with weaponized insects and strange, otherworldly storytelling. 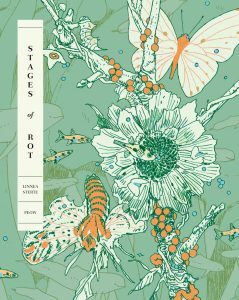 Overall, I found Stages of Rot a pleasant read; the level of craft is immediately obvious, and the thoughtful utilization of ecologic process as a springboard for storytelling was inspired. The cyclical nature of life and death makes a compelling basis for a worldbuilding exercise. But in honesty, Stages of Rot feels more like a worldbuilding exercise than a cohesive tale. The stories were slight, wispy, and left me wanting. Beautiful work, clearly. But a little hollow. Sequential State is supported by readers on Patreon. If you’re new here, take a look around, and see if you can find some new comics to love. 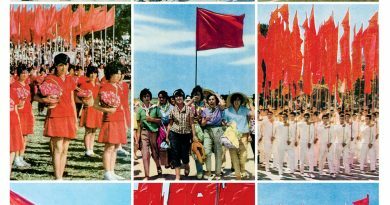 If you’re a regular reader, please consider pledging. Your support keeps the site running ad-free. Thanks!